Googleredfffd is probably a copyright holder’s best friend. It enables individuals, even those with large amounts of work to track down and stop abuses. Though its powerful search has made it possible for potential thieves to locate targets, it’s made it even easier to track back and find them after they use it. But the question arises, why Google? What makes it so perfect for not just plagiarism hunters, but searchers in general? After all, Google is alone atop the Internet search engine war, despite better-funded and equally determined opponents. What makes them so special? Google is Deep: I recently typed in a quoted seven-word search lifted from one of my poems. Google turned up 45 hits while the others, including Yahoo, MSN, Ask, Excite and Lycos turned up less than fifteen. Though much of this is due to Google’s redundancy and thus listing similar pages, it’s a level of thoroughness that is needed when dealing with plagiarism. More Data Sources: Most search engines only cover the Web, meaning HTML pages. Google also searches word document files, PDFs and other formats that other search engines can’t do at this time. Best of all, it’s constantly adding new formats to keep ahead of the game. Google Alerts: Through everything though, it’s Google Alerts that steals the show. 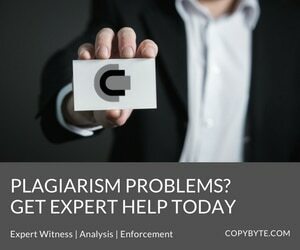 When dealing with plagiarism, you can either search occasionally and deal with old cases as they come up on your radar sweeps, or let Google search for your works daily, email you the results, and have you deal with fewer, more recent, cases along and along. This limits both the damage and the headache. Best of all, anyone with a GMAIL account can set up all the alerts they want for free. Though other search engines have come a long way recently (particularly Yahoo), they still can’t compete with Google for plagiarism detection. However, as they gain robustness and depth, that may change.. Even now though, you should probably use another search engine, like Yahoo, to back up your current search and detection scheme. Since spidering techniques differ from search engine to search engine, it’s possible Yahoo, MSN or someone else could beat Google to the punch. But even with that in mind, Google is still the king and probably will be for some time. They’re already a copyright holder’s best friend and a plagiarist’s worst nightmare, no matter how much bad rap they take. Next articleDo Your Photos Look Too Good?